Impromptu Shakespeare is an improvised theatre company. We make up a new play in the style of Shakespeare for each performance, based on audience suggestions. We decided early on in our rehearsal process that we wanted the show to be funny, and often irreverent, but that we also wanted to get it right – at least right enough that the audience could believe it might be Shakespeare. We wanted language and themes and settings that were firmly rooted in the early modern world. Getting the themes under our belts was the easy part. We all went away and brushed up on Shakespeare’s more obscure plays, making sure that in addition to lovers and kings we knew all about bears and baking people into pies. But then there was the language. Improvising in Shakespearean language is a strange experience. At first, it makes everything a hundred times harder. Improvisers are often taught never to think about what they will say next. Inhibition is the enemy: you must leap first and look later. But that’s a little tricky when you’re watching your early modern vocab, and more or less impossible when the scene demands at least the flavour of iambic pentameter. At first. When Impromptu Shakespeare originally formed, we had a two week intensive rehearsal period. We covered everything from grammar lessons on flip charts (thou, thee, thy/thine and the old third person ending -eth), to long summer evenings under an oak tree telling each other stories in pentameter. We practised extending metaphors until they snapped, and eliminated the dreaded modernism “ok” (almost). I started thinking in five feet at a time. It’s strangely addictive. Over time we have create exercises to quickly and vigorously exercise our early modern muscles at rehearsal. Of course, not everything we learned over that period comes on stage with us every time. But something flipped, and early modern language stopped being scary and jamming our gears. In fact, I discovered something unexpected. The constraint of “speaking like Shakespeare” was actually very liberating. Take pentameter, for example. If you restrict yourself in rehearsal to speaking entirely in verse, your brain focuses on finding the next foot. Content becomes secondary. When the meter is driving my speech, I therefore sometimes say things that I hadn’t expected. I say them because they sound right. And when I add into the mix the emotions of the character I am playing it, then I say them because they feel right. If I can’t decide where to take the plot, I trust in the emotion my character is feeling, leap out into a line of pentameter, and I know that the consequent language will make my mind up for me. A similar thing happens when you follow a metaphor through to its conclusion. Suppose my scene partner has compared our love to an ocean. Finding new ways to draw parallels between love and oceans can produce ideas that I might never otherwise have chosen. Suddenly I’m blaming her for the stormy spells, or admitting that my love is retreating like the tide, or confessing that I am drowning in our love. So exploring the metaphor helps to nuance the character’s emotions, creating new avenues for both character and plot development. Now when I improvise in other genres, I actually miss the freedom of riding that language – something I never would have guessed when we started out. 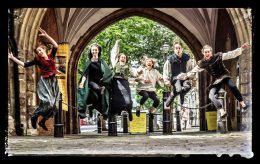 Impromptu Shakespeare are performing at the Wardrobe Theatre this festival, as well as running workshops for adults and children! Having a show on the road (and not travelling with it) is like having a friend interrailing. You’re so happy to see the pictures and hear about the friends they’re making yet can’t help feeling you should be on that journey too. People think the difficult part about directing is opening night, the moment you declare ‘this is out of my hands now’ – it isn’t. It’s knowing that your show is out there while you create the next thing. And the next. You started interrailing with one friend but let them go on while you stayed in a different town with someone else. Then met up briefly to catch up before your paths parted again, started a new journey somewhere else again. There’s a little part of you that feels like you’re cheating on your show each time you take on something else, knowing it’s still out there, meeting audiences. Richard III (a one-woman show) has been on the road for over a year now; it’s journey starting with development at Tjarnarbio Theatre, Reykjavík in November 2014 before opening at Prague Fringe May 2015. Emily Carding has performed it over 60 times in four countries. That’s one hell of a journey and it’s not over yet! I’ve been present for a lot of them, but nowhere near all of them. I get show reports and pictures and I send out press releases and tweet etc. It’s still our baby. It is always on my mind. It’s still on the road as both our careers take shape. It’s become the piece both of us are known for. So the urge to keep a firm eye on it is high. That is until you realise it was never in my hands to begin with. It’s only partly in Emily’s hands. It is always in the audience’s. That is not to say it varies wildly in terms of the script but it varies wildly in terms of the performance because we set out to explore the relationship Richard has with them. If Lady Anne is easily charmed it’s a different show to one when Lady Anne actually spits at Richard. If Buckingham is chummy with Richard we feel his death more. Whether or not we like the audience members who’ve been assigned the roles of the Princes may determine how sorry we feel for Richard when they start to haunt him. It is this, the fact that it is truly audience specific, that makes it hard not to want to see each and every performance of the show. It is also this that makes it such a mammoth task for Emily, and why, I guess, she’s not getting sick of the role a year on. She is the casting director each night, the one who needs to respond in character to each little thing the audience brings. She has to adapt to each new space, each new ‘actor’ in the other roles. It will never be the same show twice. This liveness is what I love about the show but also what I love about theatre in general. As the world harks on about Shakespeare’s 400th I can’t help but think it’s not the poetry that keeps us coming to see his plays. It’s the fact that we are directly involved. We can’t wait to see what you bring to it. Hello all, I am Tom from Folksy Theatre and I will be directing As You Like It this year. We are really excited to be performing at Boiling Wells Amphitheatre again for our 5th year as part of the wonderful Bristol Shakespeare Festival. The space is fantastic and allows us to perform in a setting very close to that in which Shakespeare and Lord Chamberlain’s Men themselves would have performed. A cheeky selfie at Boiling Wells! To mark the 400th anniversary of Shakespeare’s death this year and following our tour of Hamlet last year, we wanted to put on one of his much loved comedies and felt that As You Like It, which is often referred to as “Shakespeare’s musical”, due to the amount of songs throughout the play, would be the perfect fit for Folksy. We have a very talented cast of actor/musicians who bring the story, characters and songs to life in Folksy‘s uniquely bold, fun and accessible style. We were interested in a more modern setting for this production, with the Forest of Arden feeling free and almost timeless. As such, we have chosen a bohemian setting, rich with vibrant colours and music, to house this wonderful mix of shepherds and banished aristocrats. So lets hope the sun shines and everyone enjoys the show! Fancy spending a couple of months in a cave? Just one of a plethora of reasons why I love my job is because every now and then someone phones you up and asks if you want to do something bonkers like spending a couple of months in a cave. Being one of three new actors introduced to the pre-existing cast of 2015 was not a daunting experience in any way, shape or form. We did a run of the play on the first day of rehearsals. They all did an excellent job of putting the right props in my hands and poking me on stage at the correct time. No worries. I’ve got this. Until of course, people start saying things like ‘the ceiling is really low when we do this bit and it’s always really muddy underfoot in this section and the cave does have the odd trench so you’ll have to watch out for that too.’ And I’m nodding along with an open mouth, playing it super cool, pretending I do this kind of thing all the time. But then we have a site visit to the caves. I actually get to see it and feel it and breathe it in and I just keep grabbing handfuls of people’s clothes and exclaiming ‘This is so exciting!’ because honestly, I can’t imagine a better place to do this play, which is full of the supernatural and nature and weather and the collapse of a land. The caves are a visceral red, they are roughly hewn anomalies carved clumsily into the earth, they have their own heartbeat. It is so much easier to imagine a society crumbling into chaos when the very earth around you is scarred and tortured into being. I am sold. Insane Root’s parents, Hannah Drake and Justin Palmer, are geniuses. Once we get to technical rehearsals the practicalities of being in cave do start to hinder the process a tad. Firstly, it is very cold. And it appears that the cold is starting to affect the batteries in the torches, the lighters won’t light the candles. Also, it’s dark, who knew? Someone hears a movement in the blackness and our imaginations produce the now famous ‘vampire rats’. That’s right, they are half vampire and half rat. The ridiculousness of backstage drama is exacerbated. During a dress rehearsal, I get lost whilst attempting to lead the audience to the next scene. My wimple gets covered in stage blood and I am trapped in my chainmail! It is a gift of an experience. Something totally unique for anyone that chooses to come along. 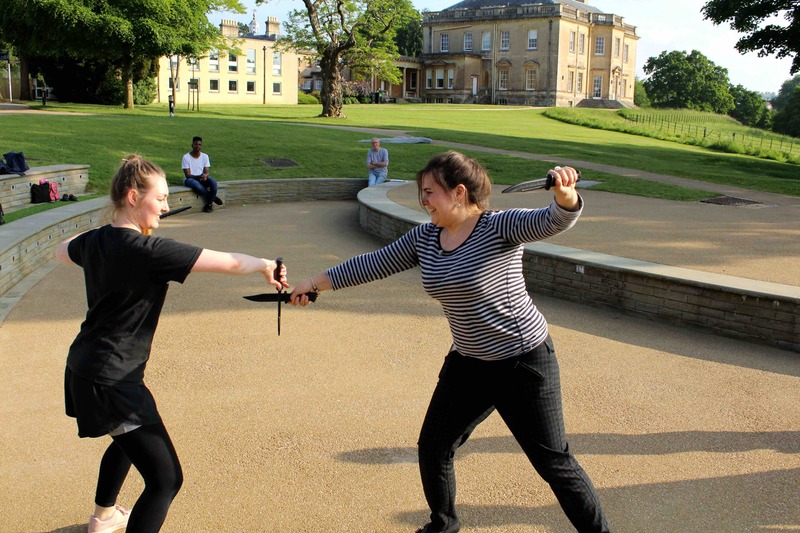 It is the wonder of Shakespeare combined with original choral songs, sword fighting and quite literally the most immersive, living, breathing set imaginable. So, please do come along. 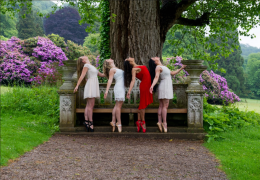 A Ghostly Gasp from South West Dance Theatre’s ‘Lady Macbeth’! In quite a departure from the original Shakespearean adaptation – traditionalists you’ve been warned! – we’re repositioning the heroine’s murderous adventures in Britain’s future. It’s a particularly bleak chapter of British politics – take all the worst aspects of today’s current affairs and amplify it a few decibels and there you have the stark setting for our re-interpretation of Lady Macbeth. Already that raised a quandary for us because without regressing to some archaic sexist hierarchy why would Lady Macbeth need her husband to act as the agent of her ambitions? Maybe you can see where we’re going here – conventionalists, chauvinists, Shakespeare purists who feel that great Will’s originals just shouldn’t be messed with, you’ve been warned again! Before I get carried away let me introduce myself – Anna Davis, director of South West Dance Theatre. As you might have gathered already we are extremely excited about the piece we are bringing to the Bristol Shakespeare Festival. The idea to work with Macbeth needs little justification – all that dark drama, murder and psychological mayhem is bursting for a voice in dance. But as we were dealing with a Shakespearean story it seemed fitting to enrobe the piece with some fittingly rich language – not all the original text, oh yes we’ve dared to deviate that far – and this also helps to reposition the story and clarify the sense of the adaptation. From there our thinking was – dance is a great way to express the drama of a Shakespearean story for people who don’t always dig the language in the more traditionally scripted plays. And that’s not necessarily down to the sometimes exceptionally breviloquent and at other times bewilderingly intricate text. There may be a language barrier or a hindrance to hearing… and so came the idea of incorporating British sign language as a beautiful way to introduce new choreographic ideas as well as providing another way for people to understand the text – thanks for the suggestion Katy Noakes! We enrolled the genius of Mark Smith to share some of his ideas as founder and director of Deaf Men Dancing, and Sandra Barefoot joined us to interpret not just the words but also the feeling of the soundtrack to the show in British sign language. This is our first time working with a bard and sign-language artist performing live, and it’s been really exciting. Two weeks before the first night at Bath Fringe we had a rehearsal where it looked like a car crash waiting to happen. But somehow it came together, with the dance and choreography winning a glowing review from Theatre Bath who summed it up as “visually stunning”. Now we want it even better for the Bristol Shakespeare Festival! And Ben Nash from Theatre 57, who has been incredibly helpful with feedback already, is stepping in to give us his directoral input as we shape it up for July 3rd at Colston Hall Lantern Theatre. We can’t wait! Hello from The Barded Ladies! Hello, we are Kat and Charlotte of The Barded Ladies! Having last taken part in the Bristol Shakespeare Festival with A Midsummer Night’s Dream in 2014, we are super excited to be returning this year. Working again with Windmill Hill City Farm, who are as accommodating as ever, has once again given us a bright and creative platform for our show. The new production, Henry VI Part III, is a bit of a departure for The Barded Ladies, not only because this will be our first large-scale show, but because our cast also includes… men! The production came to life from Charlotte’s academic work ‘The Regendering Project’, which aimed to explore the effects interchanging of gender has on Shakespeare’s texts. Now forming the basis for our production, this regendering poses questions about the role gender plays in wartime politics, and particularly in Shakespeare’s hyper-masculine history plays. Queen Margaret is arguably Shakespeare’s strongest female character. By transforming Margaret into a man and her chief adversary Richard of York into a woman, we hope to discover a new dynamic in the conflict which surrounds these characters, both in the context of their familial relationships and in the politics of Henry VI. The effect of this concept is most prominent in the regendering of Richard of Gloucester (later Richard III), where the now female character is increasingly isolated by the masculine world of which she is part. Lines such as ‘I am like no brother’ gain new meaning, and the distinctive violence which is fuelled by nurture rather than nature. Featuring male performers alongside women, therefore, was vital to making our exploration possible. An all-female company sends an important feminist message, but theatre is nothing without equality and equal opportunities. With any luck, once our work on Henry VI Part III is done, we will continue this working relationship with our new associate male artists, enabling the spread of The Barded Ladies’ ideals of inclusiveness and accessibility. Alongside our work as theatre practitioners, we are both PhD researchers, and our approach to the work we do is very much informed by that. We think of our company as a band of players rather than ‘actors’, and the techniques we use centre around play. Over our years of working together, we have adapted practices used by the Royal Shakespeare Company and Shakespeare’s Globe. Now, thanks to the new players we have on board, these practices are ever-changing, developing and growing. As our work continues on Henry VI Part III, we are more and more excited by the thought of our upcoming production week at Windmill Hill City Farm. At the farm we have a new exciting space to work with, in rehearsals a new challenge every day, and a new company, who frequently alter our perceptions of what Shakespeare is and has the potential to be. We cannot wait to be a part of this fantastic festival once again and see all the inspiring work it helps cultivate!